Development (in cooperation with the respective Design Organization, PO/DO agreement), production, qualification, certification, repair, and maintenance of electronic devices for the aviation industry in both civil and military fields. Development of hardware and software according to RTCA DO-160G, 254 and RTCA DO-178C, accomplishment of qualification tests of hardware incl. safety and reliability calculations (FMECA) and complete software verification process. Accomplishment of complete documentation in all required fields from management via engineering up to ILS, software and qualification or quality assurance, to name only the most important. Organization of the complete development process from a project management point of view including all necessary reviews and communication. The lifecycle of a product typically starts with the specification and the development of circuits, selection of electronic parts, layout of the PCB and mechanical development of the housing as well as software development according to the requirements. The specification is given to AEE either by a customer that acts as design authority (PO/ DO agreement, if required) or the development is made by AEE on its own, e.g. for an ETSO article. The developed devices can be qualified according to RTCA DO-160G (partly in-house), RTCA DO-178C up to level A (complete qualification process incl. documentation), and supportive calculations for FMECA calculations can be offered. 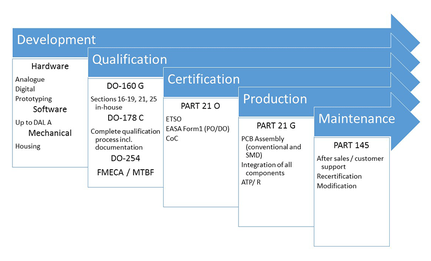 The developed devices can be delivered with EASA Form 1, CoC, or as an ETSO article, as required. The complete production and final testing process (except the manufacturing of designed PCBs) is conducted in-house in order to guarantee our customers the best possible quality of our products, combined with fast and reliable lead-times. AEE offers repair and maintenance services for the produced devices with the necessary after-sales and customer-support activities. Also modifications and recertification of existing devices to new customer requirements is in the scope of activities of AEE. To meet the high demands for product reliability in the aviation industry, highly specified testing infrastructures are used. These simulate the demanding environmental conditions in flight like variable external pressure or quickly occurring temperature variations at climbing or diving or vibrations in flight maneuvers etc. It is used to identify potential product weaknesses in the development process, in combination with thermal and mechanical stress situations, as well as to test product lifetime. Another issue is the electromagnetic interference (EMI). Therefore, technical devices will be tested for their mutual electrical or electromagnetic influence in accordance with aviation regulations. First article inspection (FAI) and qualification are compulsory parts of the approval procedure for aviation products. In this field AEE GmbH supports their customers in close collaboration. FAI and qualification have been part of our core business for many years. Our activities include consultancy in defining the test procedure, observing qualification testing as well as generating required documents. Our engineers’ expertise guarantees correct planning and test execution plus a reasonable evaluation of the test results. For other sections to be tested we have close cooperation. Each qualification is documented in a detailed qualification test report (QTR). In addition, we generate for our customers the remaining approval documents like qualification plans, qualification test procedures (QTP), declaration of design and performance (DDP) etc. Moreover, AEE GmbH offers further necessary documents like maintenance manuals, repair procedures, service bulletins and part lists. We recommend a failure mode, effects and criticality analysis (FMECA) in particular for safety-relevant devices while developing. As a result, possible sources of error can be detected during development and countermeasures can be triggered at an early stage. Choosing the right components and materials is crucial for a successful project. Irrespective of effort and scope this can be performed in-house. applicable standards and required documentation. It is important to analyze or create the Equipment Specification at the start of every (DO-178) project. Our software team is able to help analyze the specification with regards to applicable software requirements or to help you create it. 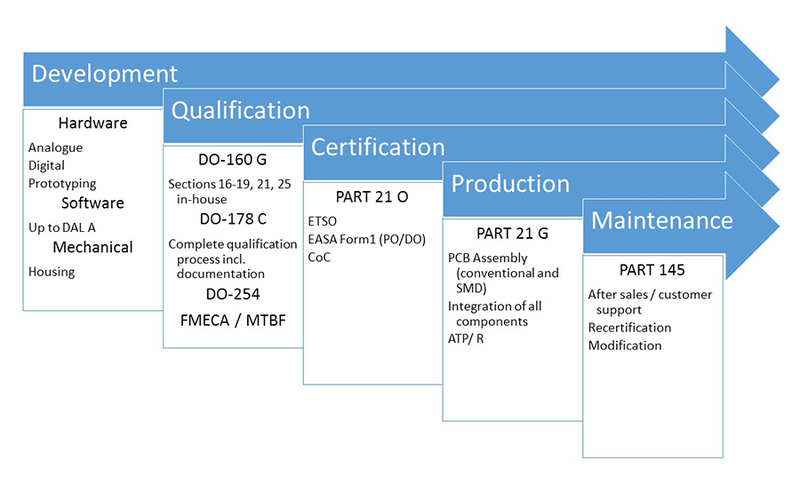 Furthermore, it is important to know all necessary details of the applicable certification requirements like DO-178, DO-254, FAR/ JAR, (E)TSO's or SAE-ARP in order to analyze the general project requirements properly. 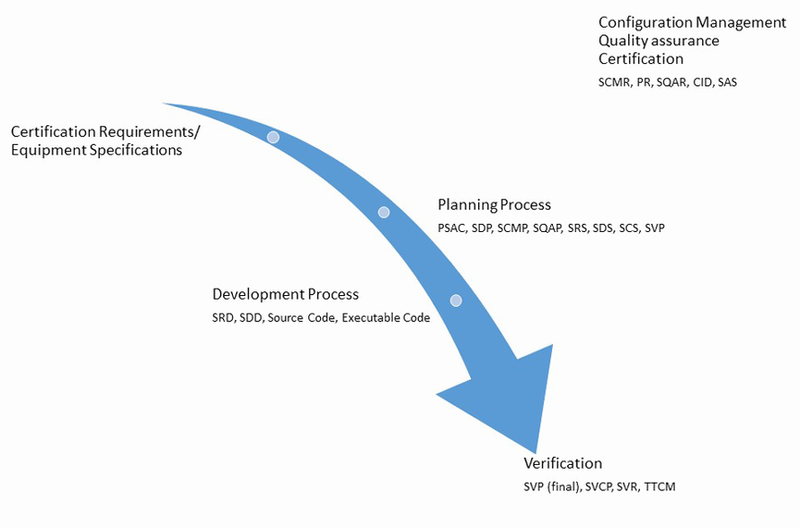 In order to prepare the project properly, it is important to generate the respective planning documentation like Plan for Software Aspects of Certification, Software Development Plan, Software Configuration Management Plan, Software Requirements Standards and others on the base of the certification and equipment requirements. Creating the Source Code and Executable Code, Software Requirements Document and Software Design Description are the main tasks that can be conducted, consulted or supported by our software team in the development process. The interconnection with the planning and verification process is easily handled on the basis of the experience and agreed processes of our work. In the final stage of the project documents like Software Verification Cases and Procedures, Software Verification Results and the Test Coverage. Traceability have to be created. Not only the creation of those documents but also the practical Software/ Hardware Integration, testing and review activities can be offered by our software team. All described activities are conducted on the base of configuration management, quality assurance and certification regulations. Not only the practical application by creation of Software Configuration Management Records, Problem Reports, Software Quality Assurance Records or the Software Accomplishment Summary but also establishing those systems in your company can be offered by our software team.